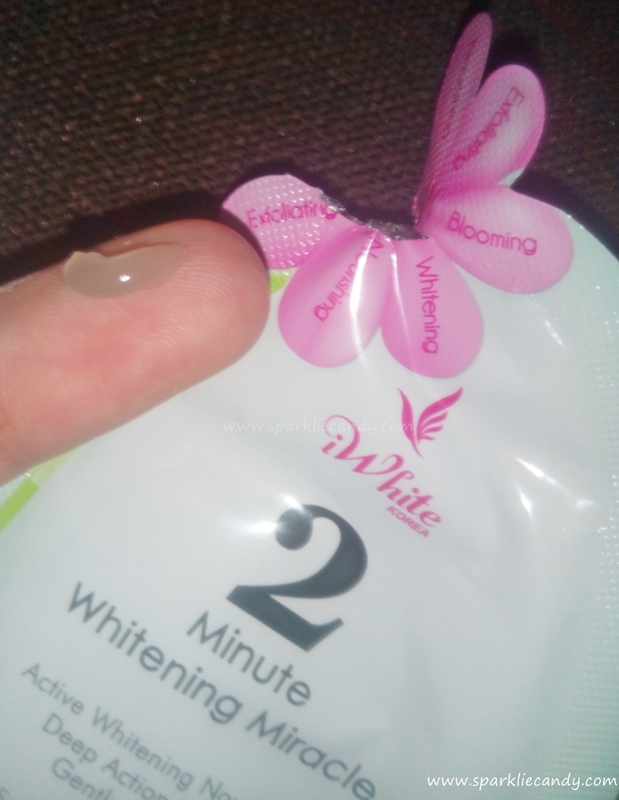 iWhite Korea 2 Minute Whitening Miracle is a specially formulated mask that gives the skin a healthy dose of whitening care with all natural active ingredients. Within 2 minutes of application, your skin receives pampering through active skin brightening nourishment, hydration and relaxation. This mask also helps in the prevention and reduction of acne and controls excessive oiliness while keeping the skin moisturized. Right now I haven't seen a tube version so only sachets are only available for now. The packaging is simple and stays true iWhite's girly vibe. On clean & dry face apply on your face avoiding the eye area. Leave for 2 minutes until the gel's texture is watery. Once the mask starts to liquify massage on circular motion. At first I was thinking that iWhite Korea 2 Minute Whitening Miracle is in a white cream form similar to their nose pack. However surprise surprise, its in gel form! The product smells like subtle fresh scent. When applied I immediately felt that it gives hydration to my skin. I didn't even know what it means by exfoliation until the 2 minutes waiting time ended. 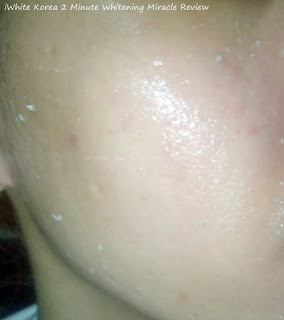 I slowly massaged my face with the dried watery gel then little white blobs which seems to be dead skin appeared. 'I use facial scrub 2-3 times a week so what is this?' as I am dumb founded with amazement that its no ordinary facial mask. While washing it off I was so surprised because my skin was so smooth! It was never that smooth before. My face looks brighter and its so fascinating what a gentle exfoliator can do. I was really planning to buy Cure Aqua Gel but its expensive for me at the moment. I am saying that this 2 Minute Whitening Miracle can be a good alternative for it. I cannot say the difference because I didn't tried the latter yet. I didn't used too much in one application so I guess I can use it for about 3 times. 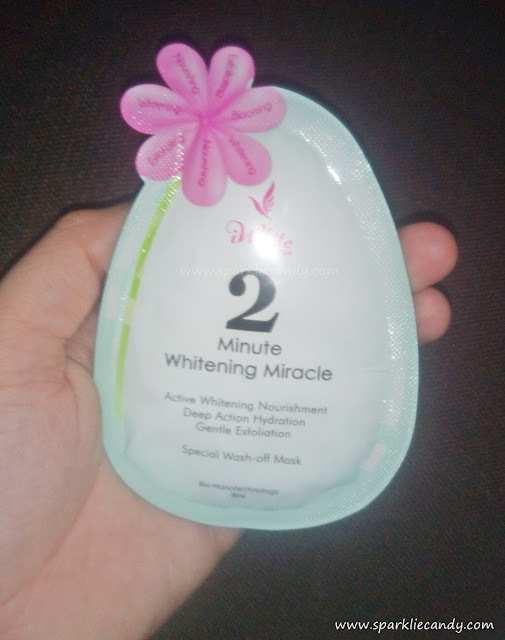 iWhite Korea 2 Minute Whitening Miracle is indeed miracle in a gel. 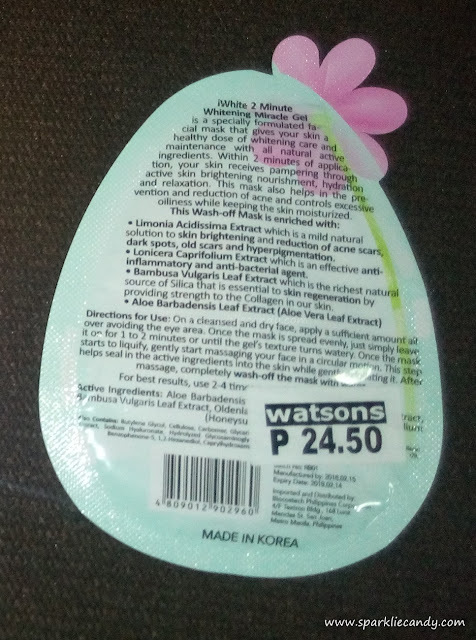 Its a very nice gentle exfoliator that doubles up as whitening mask. I cannot attest the whitening effect yet but its so fun to use! Its best to use this twice a week in place of your facial scrub. hi ate!! may i ask if i can use this when i have active acne? thank you! I think its okay. I used it and iwhite korea products never break me out or aggravate my acne! But it actually depends because of diff. skin types, u might as well try. Should I use the whole 8ml per wash?